Gear: 163 tubes in a large wooden box! I just wanted to share my delight in telling all, after doing some research, the black and blue panel keyswitches with LEDs found on the Sequential Prophet VS and 2002 are STILL IN PRODUCTION, and REALLY CHEAP! This is good news as they are notorious for going duff and requiring loads of force to operate - yes switch cleaner may help but new switches should transform your gear. Omron do the whole series in several colours of both keytop and led - so customising your Prophet is really easy! Last edited by HideawayStudio on Sat Jan 24, 2009 8:56 pm, edited 1 time in total. Hey Xpander... cool bit of additional detective work I have now ordered the switches for my beloved Prophet 2002 - it cost less than £40 for 20 switches with leds and 5 without from Farnell. Good to see that DigiKey are also doing them. Note for those in Europe - DigiKey has a UK site as well as the US one. yep, that's my VS, it is in solid condition although it's missing a couple of the side screws that's i've been meaning to replace. i've replaced control panel components on my Jupiter-6 before, the results have been fantastic and it makes for a much nicer user experience. xpander wrote: yep, that's my VS, it is in solid condition although it's missing a couple of the side screws that's i've been meaning to replace. Hey Xpander thats one nice condition VS you've got there, does the aftertouch work on that one? 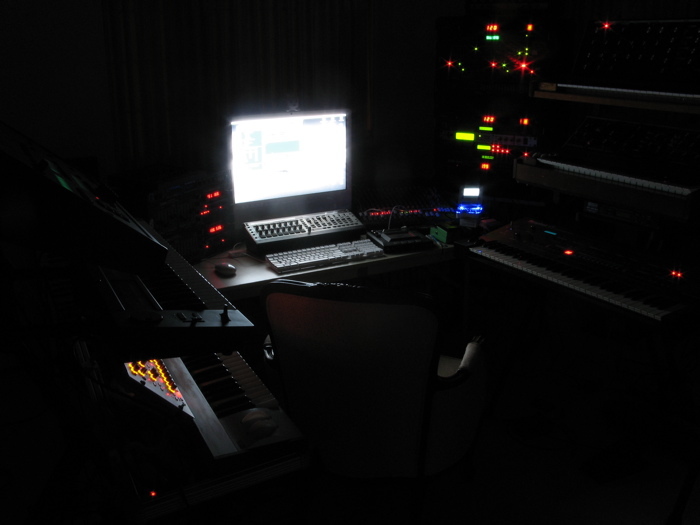 Not to get off topic but I've been wondering, where do you put your extra synths when they're not on the stand. It seems you've got a 3 tier stand and about a hundred synths . Every time you take a pic it "looks like" you just got fed up and replaced them all . Actually its probably a very good idea to help prevent the studio getting cluttered and keep the sounds fresh at the same time. You'd have to have a lot of storage though. What did you replace on the Jup6 was it worth all the soldering, pulling of hair etc? the Jupiter-6 was really easy to fix up, i just replaced a few pots and maybe a slider or two that were broken- it's why i only paid $700 for it. not a big deal & the replacements have a very nice feel. then i sent the controller board off for the Europa upgrade and ended up with a really nice synthesizer. totally worth the trouble, all of it. for my studio, the two triple tier stands are all i want set up at once. everything else is sidelined. what's on the left stand is permanently setup, the stuff on the stand to the right gets switched out (except the Pro-2000 on its mini-tier). 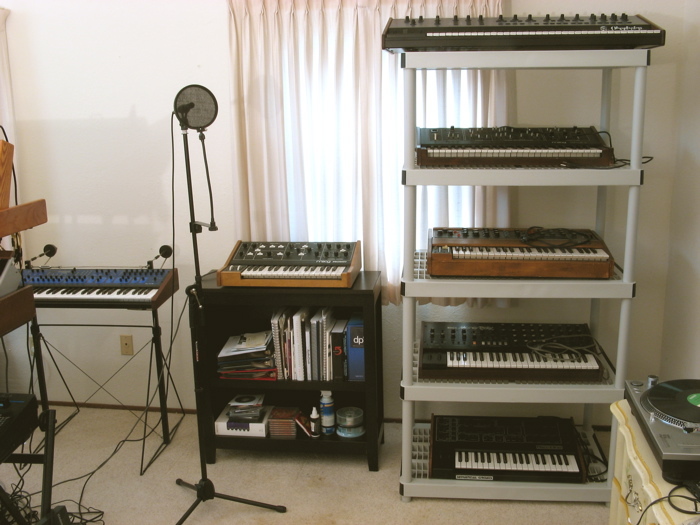 five synths are stored on a cheap industrial shelf from Home Depot and others are, well, elsewhere. too many synthesizers are a time drain, i'm melting several of them down into cash and replacing them with a 200e. Whoa! thats a very cool setup. That mini looks so cool laid flat, gotta love the walnut. Do you get much use out of the Mono/Poly? It's one of those synths I just can't decide on whether its good or bad, but it certainly looks very cool. 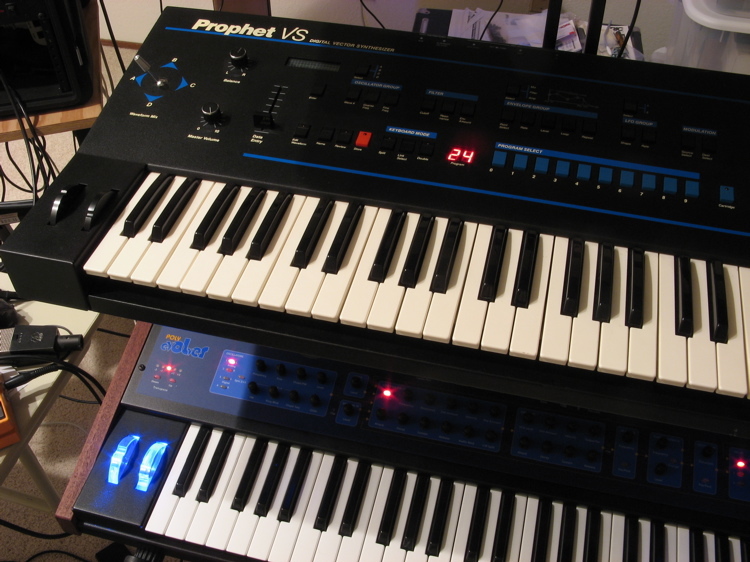 Great deal on the JP6, that one's next on my vintage poly shortlist. I kind of even like it more than the JP8, which I know most people wouldn't agree on. But hey it's my favorite Jupe for sure. PS: What synths are you thinking of selling btw? It’s only this two copper springs in the joystick, not the whole part! FYI regarding Prophet VS joysticks - The Choices EuroRack module from Flight Of Harmony uses a mechanically identical joystick mechanism - the only difference is that the pots on this one are 100k instead of the 10k pots on the original. Some users on other forums have mentioned that this does not matter as the joystick pots are used as voltage dividers only, but I have no idea if this is actually true. However, I contacted Flight Of Harmony and they confirmed that other VS owners have hit them up for joysticks - and they sold me a couple of the raw joystick mechanism so that I didn't have to buy two of their Choices modules just to cannibalize for parts. I haven't installed the replacements yet as my originals are still functional, but I wanted spares for the parts drawer. Old thread I know but invaluable.....just got a VS and ordered a load of replacement switches 'just in case' - cheers.